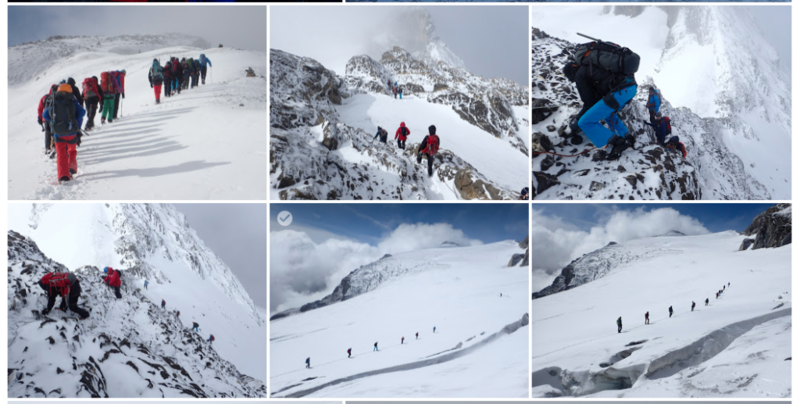 Last weekend, the LAS Alpine Club struck out for our annual ascent of Les Diablerets, at 3,210m, the highest peak in the Canton of Vaud–which is our home canton. This year brought a new twist: sleeping in a mountain hut halfway to the summit. Diablerets means “the abode of the devils”, named because of all the thunderstorms neighboring villagers would hear up in the heights. There was no thunder or lightning on Saturday, but fresh snow blew horizontally into our faces. This didn’t stop our young crew–7 out of 12 being Mexicans–from stripping off their shirts to dare the cold (before running back into the warm hut for dinner). The next morning we donned crampons for a long hike to the summit, followed by some quick ice climbing practice in a crevasse on the way down, all closely supervised by professional mountain guides for our safety. Click the photo below to see a gallery of pictures from our 2017 ascent. Click the photo for an album of pictures from our 2017 ascent of Les Diablerets.